Our research interest is to elucidate molecular mechanisms in organogenesis, especially kidney development. We also aim at derivation of kidney progenitors from stem cells, by utilizing knowledge obtained from molecular genetics. The kidney develops in three stages: pronephros, mesonephros, and metanephros. Many of the genes expressed in the metanephros are also found in the pronephros. Animal caps, a presumptive ectoderm of Xenopus embryos at the blastula stage, differentiate into three-dimensional pronephric tubules in three days in chemically defined saline solution upon treatment with activin and retinoic acid. We have used this system to identify molecules expressed in pronephros and potentially in mesonephros and metanephros. One of the genes we isolated was Xsal-3, a newly identified sal member of Xenopus, which was expressed in the pronephros and the brain. We then cloned a member of the murine sal family from the developing kidney, which proved to be a mouse homolog of human SALL1. SALL1 is a mammalian homolog of the Drosophila region-specific homeotic gene spalt (sal) and heterozygous mutations in SALL1 in humans lead to Townes-Brocks syndrome. We isolated a mouse homolog of SALL1 (Sall1) and found that mice deficient in Sall1 die in the perinatal period and that kidney agenesis or severe dysgenesis are present. Sall1 is expressed in the metanephric mesenchyme surrounding ureteric bud and homozygous deletion of Sall1 results in an incomplete ureteric bud outgrowth, a failure of tubule formation in the mesenchyme and an apoptosis of the mesenchyme. This phenotype is likely to be primarily caused by the absence of the inductive signal from the ureter, as the Sall1 deficient mesenchyme is competent regarding epithelial differentiation. Therefore Sall1 is essential for ureteric bud invasion, the initial key step for metanephros development. Renal stem or progenitor cells with a multilineage differentiation potential remain to be isolated, and the differentiation mechanism of these cell types in kidney development or regeneration processes has been unknown. In an attempt to overcome this issue, we set up an in vitro culture system using NIH3T3 cells stably expressing Wnt4 (3T3Wnt4) as a feeder layer, in which a single renal progenitor in the metanephric mesenchyme forms colonies consisting of several types of epithelial cells that exist in glomeruli and renal tubules. We found that only cells strongly expressing Sall1 (Sall1-GFP high cells), a zinc finger nuclear factor essential for kidney development, form colonies, and that they reconstitute a three-dimensional kidney structure in an organ culture setting. We also found that Rac- and c-Jun N-terminal kinase (JNK)-dependent planar cell polarity (PCP) pathways downstream of Wnt4 positively regulate the colony size, and that the JNK pathway is also involved in mesenchymal-to-epithelial transformation of colony-forming progenitors. Thus our colony-forming assay, which identifies multipotent progenitors in the embryonic mouse kidney, can be used for examining mechanisms of renal progenitor differentiation. Mutations in SALL4, the human homolog of the Drosophila homeotic gene spalt (sal), cause the autosomal dominant disorder known as Okihiro syndrome. We show that a targeted null mutation in Sall4 lead to lethality during peri-implantation. 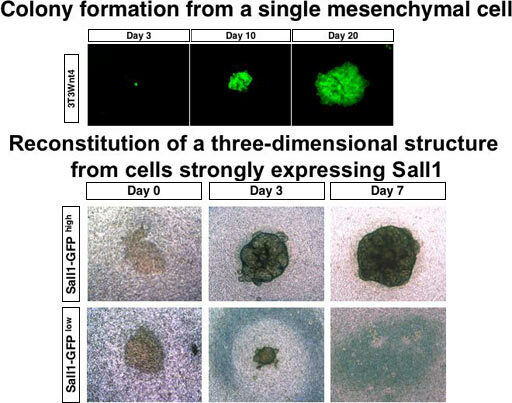 Growth of the inner cell mass from the knockout blastocysts was reduced, and Sall4-null embryonic stem cells proliferated poorly with no aberrant differentiation. Furthermore, we demonstrated that anorectal and heart anomalies in Okihiro syndrome are caused by Sall4 haploinsufficiency and that Sall4/Sall1 heterozygotes exhibited an increased incidence of anorectal and heart anomalies, exencephaly, and kidney agenesis. 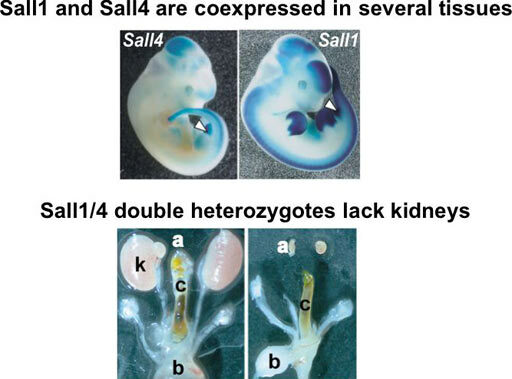 Sall4 and Sall1 formed heterodimers, and a truncated Sall1 caused mislocalization of Sall4 in the heterochromatin; thus, some symptoms of Townes-Brocks syndrome caused by SALL1 truncations could result from SALL4 inhibition.